It is indeed a privilege for me to present amidst you in this Sixty-Sixth Indian Chemical Engineering Congress and its inaugural session. This is the Annual Session of the Indian Institute of Chemical Engineers (IICE). At the outset, let me extend a warm welcome to the eminent academicians from abroad, who have come to India to participate in this prestigious event. I also accord my best wishes to the distinguished personalities from the Indian academia and industry who have gathered in this forum. IICE is a prominent body of professionals from industry, academics and research. It provides a platform for professional excellence and continuous education in chemical engineering. I am happy that for this year’s Congress, this organization has associated itself with the Institute of Chemical Technology (ICT) which completed eight decades of fruitful existence on first October, this year. ICT was founded by the University of Mumbai as the Department of Chemical Technology. It was converted into an Institute in 2002 and was granted full autonomy in 2004. It was given Deemed University Status in 2008. ICT has nurtured innumerable chemical engineers and scientists, many of whom have gone on to become heads of national level research institutions and scientific regulatory bodies, and first rate entrepreneurs. Late Manubhai Shah, Union Cabinet Minister for Industries and Commerce in the late fifties and early sixties, was also a student of this prestigious institution. Since its inception, activities in ICT have centred on research. Its emphasis on development of novel green chemical technologies, materials, pharmaceuticals, energy systems and biotechnology have lend itself a unique position amongst similar institutes in the country. With over 2,200 students, including 700 PhD students, and a high number of patents and papers per faculty, this reputed Institute is destined to achieve greater heights in technical education. Pandit Jawaharlal Nehru, India’s first Prime Minister, was a strong votary of Science and Technology in the country. He was truly impressed by its metamorphic powers as illustrated in his observation, which I quote: "India can liberate herself from the clutches of poverty, bigotry, superstition and ignorance only by the extensive and humane application of science and technology and spread of industrialization” (unquote). These words are still relevant as we grapple to find solutions to eradicate socio-economic problems like poverty, hunger, illiteracy and disease. IICE, by conducting this conference on the theme: ‘Innovative Approaches for Food Security and Healthcare for Better Tomorrow’, has sought to engage stakeholders on this crucial development imperative. I applaud IICE for the same. The chemical sector touches human life like no other. Products of the chemical industry find wide application – as day-to-day products in the life of people; as fertilizers and pesticides in the cultivation of agricultural crops, and as inputs and building blocks in the production of industrial goods. The deep linkages that the chemical industry has with the rest of the economy provide sufficient elbowroom to this crucial yet understated sector to effect major transformations. 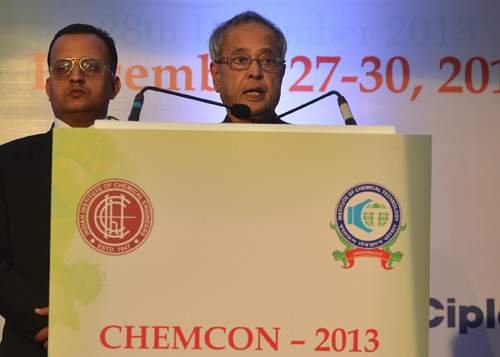 The prospects for development of the Indian chemical industry are high. With Asia’s contribution in the global chemical industry rising significantly during the last fifteen years, and the Indian economy performing impressively, India has emerged as one of the important destinations for global chemical companies. The Indian chemical industry, at US Dollar 108 billion, is three per cent of the global market. There is every reason, this share can rise. This sector in India can clock an annual growth rate of fifteen per cent to become a US Dollar 290 billion industry by 2017. Turning this into a reality calls for preparation of a road map that takes into account all growth-inducing aspects - research and development, enhanced capacity building of workers, and provision of better infrastructure to chemical units. The research and development expenditure of our chemical industry is at present less than 0.5 per cent of its revenues. A significant scale-up in spending to the global benchmark of 4 per cent is necessary. Institutes like ICT are perfectly positioned to play a big role in research and technology development in chemical sector. The expansion envisaged in chemical industry also underlines the need to make available an additional five million skilled professionals by 2017. Technical institutes must be strengthened to shoulder the burden of meeting the manpower requirements. To provide infrastructure support in the form of adequate power and water to units, the Petroleum, Chemicals and Petrochemicals Investment Regions must be leveraged. Investments planned in these zones must be realized on priority. Along with growth, the chemical industry must give equal emphasis to the adherence of safety, health and environmental standards. The industry must promote sustainable development by investing in technologies that safeguard the environment while stimulating growth. They must adopt new technologies that are aimed at tackling the problem of industrial waste. They must set targets and follow benchmarks to reduce the stress on environment. The Indian agriculture sector is closely associated with the chemical industry. Use of fertilizers and pesticides has for long demonstrated the capability to enhance farm yield and production. These inputs have played a decisive role in developing the agriculture sector in the country. Our agricultural system was under-developed at the time of Independence. The Green Revolution in the Sixties was ushered in through multi-directional initiatives. India soon became self-sufficient in food grains. We are today a leading exporter of rice and wheat. Though the Green Revolution brought about a considerable rise in food production, the disproportionate use of chemical fertilizers eventually led to a decline in productivity. Today, our annual food grains production is over 250 million tonne. We have to expand production levels significantly to meet the needs of a growing population. This underlines the need to improve farm productivity. At the same time, it highlights the need to promote balanced use of fertilizers and pesticides. With the concerted effort of agricultural and chemical technology institutions, we will be able to achieve greater efficiency in fertilizer use. A critical link exists between chemical sciences and engineering, and the society as a whole. We must cultivate this bond. For that, we have to attract talent to this important knowledge stream. We have to develop greater awareness about the prospects of this beautiful and enchanting field. I am happy that we have honoured a world famous chemist, Professor C.N.R. Rao, with the Bharat Ratna this year. I am confident that this will spur greater interest in chemical science and technology in the country. A forum like the Indian Chemical Engineering Congress, which I am proud to be a part of, will also help in engaging this sector with the community at large. With these words, I conclude. I wish you all a successful conduct of this event.